Having an ice axe attached to your pack makes you look cool. 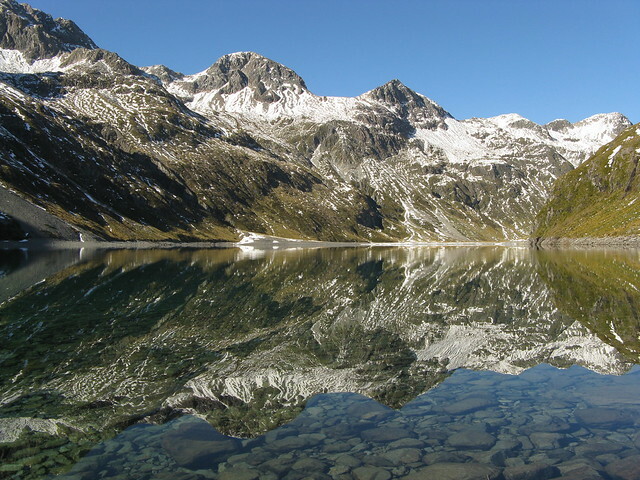 Therefore, what better way to spend Easter than four days in Nelson Lakes National Park with an ice axe, and also with people who are friends? Well, there are possibly other things that could be at least as good, but the ice axe and other people in Nelson Lakes thing is what I did… despite having begun the trip without an ice axe. Bernie in front of Lake Constance. 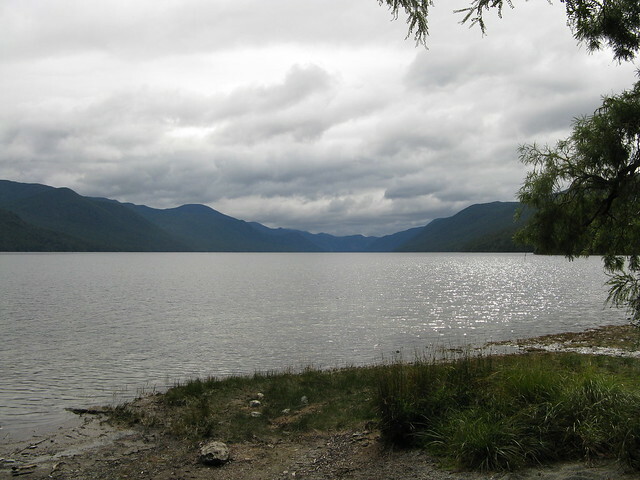 Location: Nelson Lakes National Park, Lake Rotoroa. People: Hans, Mika, Marie, Jen, Matthew, Bernie, Paul, and me. Huts visited: D’Urville Hut (0 nights), Morgan Hut (0 nights), George Lyon Hut [formerly Ella Hut] (1 night), Blue Lake Hut (1 night), West Sabine Hut (1 night), Sabine Hut (0 nights). 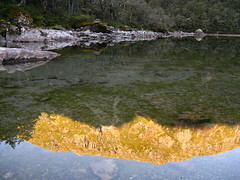 Route: Water taxi to D’Urville Hut, south past Morgan Hut to George Lyon Hut for Friday night. 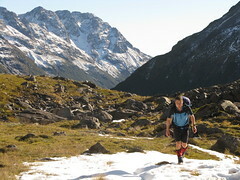 Climb over Moss Pass and down the other side on Saturday, to Blue Lake Hut. Roam around and explore on Sunday morning, then continue north up Sabine to West Sabine Hut in afternoon. Continue to Sabine Hut (and return water taxi) on Monday. Our trip had been carefully planned by Steve, who sadly had to withdraw at the last minute over a foot he injured during the Oxfam 100 km Trailwalker the previous weekend. Having hired a cheap rental van and taken it onto the Interislander from Wellington on Thursday night, we arrived at the end of Lake Rotoroa some time well after midnight. I don’t know exactly what time it was, but I do know that after setting up some tents and flies, we were drifting off to sleep some time after 1.30am. We discovered at late notice that we’d almost mis-calculated how much shelter to bring and were short by a small fly or so. Thankfully, however, enough people had brought their own anti-social tents beyond the need of the organised plan. Marie crunched into Hans and Mika’s tent, Jen and Paul set up their small one-person tents, while Bernie, Matthew and I slid under my Huntech two-person fly, which can easily and comfortably accommodate three people despite the name. 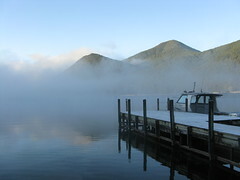 Lake Rotoroa on a chilly morning. The early morning bed-time may potentially have been an issue, as we were also booked on an 8am water taxi over the lake. 5.5 hours of sleep later, we crawled up and packed in the cold. Hans’s plan was to have a quick snack before heading over to the water taxi, and then have a proper breakfast at D’Urville Hut on the far end of Lake Rotoroa. The water taxi ride over the lake was typically photogenic, with a thick mist overhanging the northern end of the lake, slowly lifting as we approached the southern end which was more exposed to the morning sun. Our first day was to be the furthest distance, although it was basically to be walking in a straight line along the D’Urville River on the flat to George Lyon Hut for the night. Paul wasn’t feeling completely confident with his current condition for getting over the pass, however, and after some discussions which revealed he was very self-sufficient right down to his own tent, about twice as much food as necessary, a GPS receiver and his own personal EPIRB, he elected to catch the ferry slightly further and thus start on the Sabine side, skip Moss Pass and walk directly up the track to Blue Lake Hut to meet us there in a couple of evenings’ time. Before we left, I had some concern that most of the walk could just be along straight, flat, well-formed tracks down a valley, which is more or less what it looks like on the map, and is similar to the last time I visited Nelson Lakes. It eventuated that for a while there was more of the same. The track that follows the river is actually some way above it, so there are few convenient opportunities to simply scoop water out of the river. The one time that we did venture onto a flat, the track didn’t. The flat ran out within a few minutes, and ended with an awkward and uncertain clamber about 30 metres up steep and unstable hillside to find the track again. After three hours we reached Morgan Hut, somewhere between half and 2/3 of the way to our destination along the D’Urville River. In the bright sunshine, Hans had already pulled out his soppy tent fly to dry it on the grass, and I did the same with my own open-ended fly. The hut is parked in front of a vast meadow, and a few wasps buzzed around as we munched our lunch. It was another hour before we actually stood up and left towards our final destination for the evening, eventually reaching George Lyon Hut (formerly Ella Hut) about two hours and 45 minutes later. an evening at George Lyon Hut. The hut has two rooms behind a small entrance-way, almost identical with eight bunks each except that the room on the left has a stove. Four people were in the stove-heated room already, so we settled into the other room. With some consideration we decided not to bother them for use of the stove, and in our own room we cooked a wonderful meal of Thai Green Curry, prefixed by an entree of Pita Bread in dip, which had been cleverly crafted by crippled Steve who sadly remained at home in Wellington. Hans and Mika had lots of candles, and after dinner Mika improvised candle holders from the dip containers. We chatted with each other about topics such as maximum amounts that people should carry based on their body-weight, leading into discussions about the benefits of eating pies. Bernie was kind enough to take the rubbish we produced that evening. For half an hour or so, I lay out on the deck under the stars, eventually watching the glow of the Moon slowly appear behind the Mahanga Range. The route over Moss Pass appears absurdly short for a day’s walk at first glance. 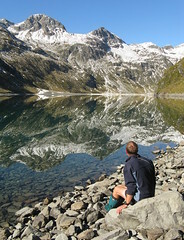 There’s a 2 km walk south beside the D’Urville river, followed by about a 4 km walk to Blue Lake Hut in the next valley. My first impression when the well organised and sadly to-be-crippled Steve first showed me his favoured route was that it’d take a couple of hours. Then I noticed the contour lines, showing a steep 1000 metre climb followed by a 700 metre drop. Suddenly my primary school knowledge of Pythagoras’s theorem told me that a 4 km walk had become a 4.4 km walk, but more importantly it was probably going to involve some steep clambering. This alone wouldn’t account for the 7-8 hour walk advised by the Department of Conservation, but it eventuated that we were also held up by details such as lunch, stopping for ages to look at some impressive scenery, and various injuries. A curious South Island Robin hopped about in the nearby branches as we left George Lyon Hut at 8.15am on Saturday morning, beginning with a short walk for about 45 minutes to the swing bridge that crosses the D’Urville. Marie looked mightily impressive with her ice axe and I begged to be able to carry it so I could share in the prestige value of having an ice axe on one’s pack, but she wouldn’t let me. and Jen below the bush-line. To the tree-line it’s about 600 metres of vertical climbing, and fairly steep. Some people would hop up it rather quickly, but most wouldn’t and we didn’t either in our sizeable group. It’s completely manageable, though, and the section under the tree-line is not unlike a route up many of the spurs in places like the Tararuas and the Ruahines with which I’m more familiar. One short section of the marked route involved a short skimp up a slanted rock-face, and a kind person had left a knotted rope for assistance. Even then I’m not sure it was entirely necessary, and as I waited for others to get up the rope, I even wondered if it’d be possible to find a short detour out to either side in the trees so as to avoid climbing directly up the face at all. On the other hand, maybe that rope was there for a good reason. We stopped for a casual photograph, and then my dream for the past 80 minutes came to life, when Marie finally decided to give in to my earlier request and let me have the privilege of taking the trophy ice axe for a while. I took it quickly lest she change her mind, and immediately felt that warm glowing feeling that one gets when they can display an ice axe on their pack. 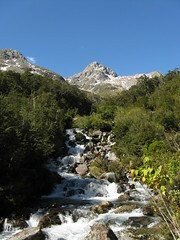 A stream at the bush-line. The trees thinned during the climb, eventually opening into a wide panoramic view of the Ella Range on the far western side of the D’Urville River below us. At the tree line there was a nice stream, where we re-grouped for a while, took more photographs, and re-filled water as necessary before continuing up into the sunshine. It was nice that the views over the valley were finally opening up, and we were getting some reward after an entire day of walking up a track above a river and under trees. Bernie bounded ahead and scouted out a good route, which was helpful because at that time in the morning before the Sun had imposed itself, much of the rock was still covered in sheets of ice. In a couple of places it was necessary to be quite careful. Jen climbing up an icy rock. The route is poled the entire way, and we walked above the tree-line for about two and a half hours, sustaining some injuries in the process. Jen had been increasingly concerned about some knee problems which were proving difficult on the unstable moraine above the tree-line. To compound matters, Mika managed to damage a calf muscle some way up the hill, and thus had quite a painful walk for much of the second day. Both of them were heavily strapped in whichever ways were most appropriate, but unfortunately it was only a partial solution. It was all good though, and with such fantastic weather I think we would have taken just as long if everyone was feeling perfect. 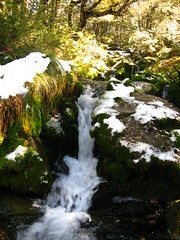 the saddle of Moss Pass. Bernie easily reached the top first with everyone else filtering up behind him at their own pace. Taking that final step onto the saddle and seeing the Sabine Valley suddenly open up on the far side, with the realisation of being completely surrounded by beautiful scenery, was actually quite awe inspiring. As I stood in the light breeze for a while at the top of the saddle, I checked that I still had the ice axe, and then appreciated the moment before continuing down to join everyone else at a marginally more sheltered area a few metres below, where we ate lunch. The ice axe still hadn’t been needed, but that wasn’t important. Moss Pass on the Sabine side. We stood up to leave after lunch at about 1.45pm, but it wasn’t absolutely clear where we should be walking off the Sabine side of the saddle. The poled route seemed to point directly down a steepish-looking avalanche chute with some initially uncertain-looking snow. Meanwhile, a cairn had been built a few metres away, and appeared to be designed to encourage people to walk off in another direction before curving down to meet the poled route below. Marie began creeping down the right-hand side of the chute, cautiously at first, and we eventually confirmed that the snow was fairly safe. From then on we were able to use it to get down quite easily, apart from both Mika and Jennie who were still quietly writhing in pain with knee and calf problems until the ground became more stable and predictable. Looking back towards Moss Pass. As the descent flattened, our poled route off the pass sidled us around a combination of scree, moraine, and vivid green landscape that was lightly dusted with snow. Straight ahead down the valley, we could see Mount Travers, and Mount Hopeless in the distance. In front of Travers was the spur that led down to West Sabine Hut, although with our plan we wouldn’t see that hut for another day. Below us, Blue Lake stood out clearly, and for 30 minutes we stopped and sat down, simply to take in the scenic surroundings while the Sun was still shining. Blue Lake on Saturday night. The remains of the route down the hill followed a small stream that channelled snow-melt down to the Sabine River. Spaced out, we rolled into Blue Lake Hut some time before 4pm. By the end of the day, it’d taken us a bit less than seven hours to walk around 6-7 km, so we didn’t exactly average a very fast day. The hut wasn’t exactly empty when we arrived either — quite the opposite. One chap who stepped outside commented that the ice axe tied to my pack looked pretty hard out, but he accepted my response when I told him that I’d really only brought it to look cool. Inside I felt ashamed to know it was really Marie’s ice axe and that I’d nicked off with it earlier in the day. She’d probably want it back soon, but I still jealously wanted to keep it. We were supposed to be meeting Paul here, with him having walked up the Sabine River to meet us, and were concerned when he wasn’t present. Discussions with with several people who’d also come up the Sabine implied that he might have been held up somewhere and possibly wouldn’t arrive. Our concerns were put to rest within an hour. Paul returned from a side trip he’d made out to see Lake Constance, which wasn’t far away, and then we all suddenly recognised his pack which had been leaning against a bunk in the hut for the entire time. Being fully prepared as he was, Paul also had much more food than he needed, and was generous in handing it around. Twenty one people shared Blue Lake Hut that night, so I guess it was quite a popular place over Easter. This number didn’t include Jennie who’d decided to set up her tent outside rather than share our cramped and stuffy dwelling, or the two people who were camping around the corner next to Blue Lake. 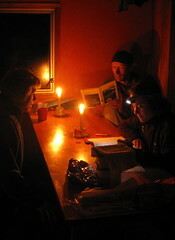 For dinner, we crowded around a table at one end of the room, which we shared with a young German guy who was writing a diary, and consumed our meal of spiced chickpeas that had been cleverly crafted by crippled Steve who sadly remained at home in Wellington. Hans and Mika had lots of candles, and after dinner Mika improvised candle holders from the chickpea tins. We chatted with the German chap about what he could expect on Moss Pass the following day. Bernie was kind enough to take the rubbish we produced that evening. For half an hour or so, I shuffled around trying to find enough space to stretch out on the floor between a muddle of boots, packs, and inconveniently placed tables. Not having remembered to dry it out earlier, Jen’s tent still had some moisture inside which by late evening had morphed into shiny stalactites. Apparently it wasn’t too bad though, and probably still preferable to sharing the hut with so many other Easter trampers. Marie and I were both on the floor, and two couples were double-bunking down the far end. There was surprisingly little snoring, however. 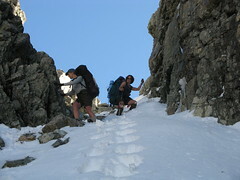 The third day of our expedition was to be a very easy day. Even the DOC signs only estimated a 3.5 hour walk along a nice track to West Sabine Hut. It was so easy, in fact, that we didn’t intend to leave until after mid-day. This, of course, left all morning to explore the area. Matthew climbing over Blue Lake. With time to spare, Matthew, Bernie and I decided to go for a walk in the other direction to see Lake Constance. On yet another bright sunny day, we put safety first and took our raincoats, sharing one pack between three of us with the idea that we’d switch it around at some point. Matthew took it first, and this meant that he had the privilege of carting it up a vertically 200 metre climb on the far side of Blue Lake. We passed several three metre patches of soft snow near the top and I was already regretting having left the ice axe behind, but I survived the shame. Several “just over the next rise” comments later, the route finally plateaued, and soon we saw what really was quite a stunning sight of Lake Constance in front of the mountains not long after sunrise, in all its reflective awe. Wow! First views of Lake Constance. More views of Lake Constance. I took over the pack at this time, and after some general gawking at the scenery from above, I carried it down about 50 metres of moraine, with some thin covering snow, to the edge of the lake. For half an hour the three of us just sat on the edge of the lake, watching and throwing stones to induce ripples in the reflection. I promptly forgot to collect the pack when we turned to leave. Matthew picked it up again, and eventually took it all the way back to Blue Lake Hut… so Bernie and I got off lightly. Rather than climb back up the moraine that we’d come down, which would have been easy, we decided to try something that was surely even easier, and sought a more direct route up the boulders to our right. We could see from the bottom that the plateau we wanted to reach was right at the top, and it looked short and easy. Naturally, of course, it was only deceptively short and easy, but turned out to be educational instead. Over a rather uncertain twenty minutes, three of us found three separate paths hopping up and around and occasionally down parts of the sometimes icy boulder slope, before finally crawling over to the top with some minor relief — except for Bernie who possesses a perpetual smile. We made our way back to Blue Lake Hut to meet with the others, who were happily drying out socks and boots and tents, and generally enjoying themselves. Hans and Paul were still roaming somewhere in the vicinity of Blue Lake, but they returned for lunch and at 12.25pm we prepared to leave. Checking the back of my pack which I’d left at Blue Lake Hut, Marie’s ice axe was fortunately still exactly where I’d left it, meaning she hadn’t (successfully) stolen it back whilst I was away as I’d been half expecting her to try. Pulling the compass out of my pocket, I noticed that Marie was exactly south-west of me as she sat on the step at the front door. This was disconcertingly consistent with a folk tale that I’m sure I’d heard in the past about how you can never completely trust someone to your south-west, especially when you have their ice axe. I strategically changed the subject of our conversation away from ice axes, and I think this was the main reason why Marie forgot to ask for it back, allowing me to keep looking cool for yet another day in New Zealand’s back-country. Part of the Sabine River. I hoped that unlike our Friday experience, the track from Blue Lake heading north along the Sabine would be more accessible to the river. Happily it was, and I was able to comfortably walk without carrying much water, and with my mug attached to my pack for easy access whenever I felt thirsty. It’s quite a very nice walk, and not too artificial and graded as some of the tracks around here are. It passes several avalanche paths directly over scree slips, and on a couple of occasions we found ourselves climbing through some rather thick (but not too cumbersome) tree-fall which had yet to be cleared from the August 2008 storms. The Sabine River includes several impressive rapids in this vicinity, and steep sides of the valley combined with streams running down from the snow-melt above result in quite a few cute waterfalls. One of the robins that followed us. We didn’t see much bird-life but we heard it up in the trees. 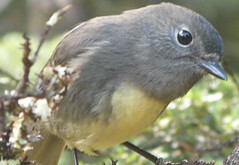 We saw a few fantails, a tomtit, and for a while Jennie and I were chaperoned by another very curious South Island Robin, presumably more interested in the insects we were kicking up than it was in ourselves. At 3.15pm we saw West Sabine Hut over the river, and 10 minutes later after crossing a bridge and back-tracking on the far side, we reached it. One party of Wellingtonians who’d been up Mt Travers earlier in the day was leaving as we arrived, and that night we shared the hut with perhaps twelve or fifteen others, at a guess. This was fine because its designed for about 34 people, and the platform bunks would make it easier to cram in even more people if necessary. We crowded around a table next to the door, and consumed our meal of Moroccan Couscous, which had been cleverly crafted by crippled Steve who sadly remained at home in Wellington. Hans and Mika had lots of candles, and after dinner Mika tried to improvise candle holders but couldn’t find any suitable rubbish. Bernie helped out by fishing out our old candle holders from the rubbish bag. Then we chatted about topics such as hut passes, looking cool, and carrying ice axes. Bernie was kind enough to take the rubbish we produced that evening. 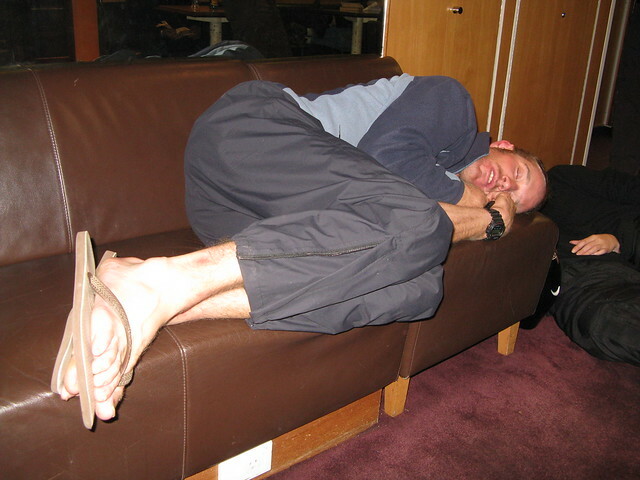 For half an hour or so, I lay up on my bunk reading my FMC bulletin, before I dozed off to sleep. Our final day was to be another very cruisy day, simply following the main track back along the Sabine to Lake Rotoroa for a 2pm water taxi collection. For the first time during the tramp, the weather was muted with light grey clouds and occasional drizzle. We didn’t mind at this point, and for me it was almost welcome to have some contrast. 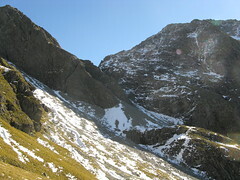 The track still follows several avalanche paths, but nothing complicated to traverse. 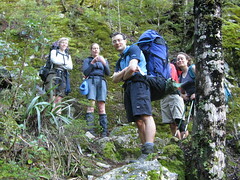 We shared the track with a couple of other parties who were also walking between West Sabine Hut and Sabine Hut. At our lazy pace as we were overtaken, I watched quite awe-struck as a man walked past with not one, but two ice axes attached to his pack. Then I understood as his contrastingly un-cool girlfriend approached and walked past behind him. I think all I can truthfully say about this sorry scene is that nobody likes a show-off! At 11.40am, about 30 minutes ahead of the posted DOC time, we reached the track junction that could have given us the option of crossing the D’Urville River and returning to D’Urville Hut where we’d begun on Friday morning. Very coincidentally as we were standing around, the young German chap whom we’d met a couple of nights before wandered up from the direction of D’Urville Hut. He’d crossed Moss Pass, spent the previous night at Morgan Hut all on his own, and really enjoyed himself, and was now on his way up to Angelus. 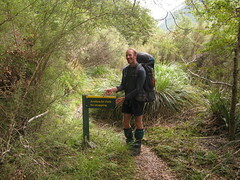 Shortly after this junction, along the short track back to Sabine Hut, a bridge crosses a deep gorge. The water was clear and the trout in the river below were also obvious. With our trip reaching an end, Marie and I left first, wanting to knock off the final leg to Sabine Hut on the edge of the lake. We arrived to a welcoming party of wasps and sandflies, and very quickly sought refuge inside the hut with several other people, to eat lunch as we awaited our 2pm pick-up. As we rode the length of Lake Rotoroa, the ferry operator informed us that the 17-18km track along its north-eastern side was still very damaged by tree-fall from the August storms. The Department of Conservation has been prioritising other work in the area, and signs still exist at either end to indicate the damage. Although it’s supposed to take about 5 hours give or take, one group recently took 3 days, and the water taxis get regular call-outs from people who’ve simply dumped their packs half way along so they can escape more quickly, but then need to return to collect them. 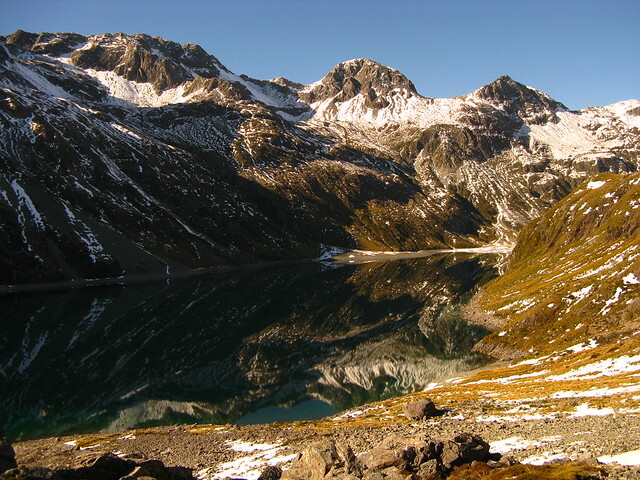 Lake Rotoroa from near Sabine Hut. It worked out as a really nice weekend, and the weather played its part. I enjoy a little rain and wind from time to time, but part of its attraction is that it helps one really appreciate things when the weather’s simply bright and sunny for four days in a row… particularly when it’s a place with so much alpine scenery. We stopped for ice-cream and pies at St Arnaud, which incidentally has a very good meat pie shop, ensuring that by our increase in body-weight we’d all be medically cleared to carry heavier amounts from now on. For a time in the van as we traversed the system of roads back to Picton, Bernie and I considered what we most enjoyed about the trip. It’d been quite a long way to come from Wellington. 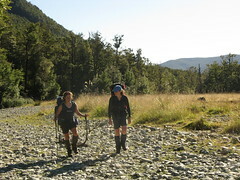 Why would people travel like this to walk around Nelson Lakes National Park? Especially when you could go to, well, maybe the Akatarawas or the Aorangis if undulating terrain is desired, or the Duck Pond outside the Whitby shopping centre if visible birds are required for one’s enjoyment. It took some deep consideration, but just as Jerry Springer commentates something deep, meaningful and relevant at the end of each of his shows, I came up with a decisive-sounding conclusion to recent events. I decided that it’s probably a combination of the people and the ice axes which make a weekend so enjoyable. Many of my trampey club friends happened to be going there, I was able to carry a grunty looking ice axe to help me look cool, and by tagging along and following everyone I had a hand in some very nice meals thanks to crippled Steve whose presence we would have enjoyed if he’d been able to come. We also got to walk up mountains and in snow and stuff, and did I mention how impressive I was able to look with an ice axe tied to my pack? 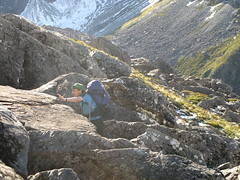 This entry was posted in tramping and tagged bagged:blue lake hut, bagged:d'urville hut, bagged:george lyon hut, bagged:morgan hut, bagged:sabine hut, bagged:west sabine hut, favourite, moraine, nelson lakes, snow, tramping, wellington tramping and mountaineering club, wtmc journal. Bookmark the permalink. I really enjoyed your writing on this post and what a fine trip it reads, and looks, as being. I think you should invest in an ice axe Mike, your ice-axe envy is palpable. Have a great weekend. Thanks Robb – gosh I’m still doing some proof-reading I guess. I see something else every time I read it. And yes, you certainly can’t beat a good ice-axe when you need to feel as if you know what you’re doing. Well Mike, I am going to take a trip up Mount Kapakapanui tomorrow (interestingly, when I did a search for info about the track, your blog came up)…on the basis of your recommendation, I’m going to take at least one ice axe. Yes! 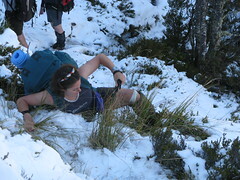 Ice axes are essential in the Southern Hemisphere at this time of year! Weather is looking great where I’m going he he… I still haven’t bagged Mitre Flats!!! People like yourself are so pointlessly inefficient. 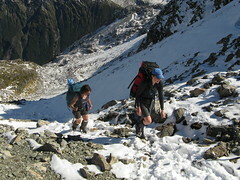 With my expertise in light-weight gear, I know that a single ice axe is all that’s needed for any regular tramping. Most people don’t know or care much about all the extra bits of climbing gear anyway, so an ice axe (or possibly two) is perfectly sufficient to impress those around you. I ask you, why weigh yourself down by loading yourself with unnecessary and useless extra mass?? We’re not all super-strong!! Hi Sarah. I bet that was nice — I’ve still not been to Angelus. I hear the new one’s quite spiffy.